Many people don’t realize that their tax problems can hurt their credit. When you owe money to the IRS or MA DOR (or both! ), and you don’t pay your tax debt, you can wind up with tax liens. Tax liens are public record, which means anyone can find out about them. All of the credit rating agencies use tax lien information against you when determining your credit score. A good credit score is, as Sal discovered, essential to the way we live our lives today. Even the US Government seems to have figured that out. That’s why there are special incentive programs in place to encourage delinquent taxpayers to resolve their tax issues and repair their credit. Don’t Try To Fix Your Tax Problems On Your Own! Working with a skilled, experienced firm that specializes in solving tax problems gives you the widest range of options when it comes to having your tax liens released or withdrawn. The IRS and MA DOR are not in the business of advising tax payers how to best solve their tax problems and restore their credit – they’re focused on collecting the maximum amount they can from you. The Fresh Start Initiative allows delinquent tax payers who meet specific qualifications to take steps to repair their credit. If you owe the IRS less than $25,000 and can comply with a direct debit payment plan, after you’ve made 3 payments, you can request a lien withdrawal from the IRS. This is only one of the ways you may qualify for the Fresh Start Initiative. Your experienced tax problem solver will fill you in on other available options to obtain a lien withdrawal. All tax lien withdrawals have a very positive impact on your credit rating. Be aware that you’re required to remain in full compliance with the tax laws going forward, and it’s an opportunity that’s only available once. Is the Fresh Start Initiative right for you? The best way to get an answer to that question is to consult with an experienced tax professional. Schedule your free, no-obligation consultation today to discover how you can fix your credit and get your life back on track! If you owe back taxes to the IRS, you have undoubtedly wondered how on earth you’re going to get a mountain of back IRS taxes off your back so you won’t have to live in fear anymore. Living with IRS tax problems is stressful and can cause many problems in your life. One of these IRS tax problems is having an IRS tax levy placed on your wages or bank accounts which leaves you with little to no money to live on. An IRS tax lien can also be filed against you in the public record (usually the county recorder or registry of deeds) which not only lets the world know about your IRS tax problems but severely damages your credit rating by a good 100 points or more, leaving you unable to get a loan. So what can you do to resolve your IRS tax problems? Although Offer In Compromise is advertised heavily on late night TV, it is rarely an option for most people with back IRS tax debts. Roughly 95% of delinquent taxpayers with IRS tax debts do not qualify for the IRS Offer In Compromise program. Unfortunately, these late night TV hucksters tout the OIC as the magical cure-all for your IRS tax debt woes. There is an old saying, if it sounds too good to be true, it probably is. And so it is with the Offer In Compromise program. Although my tax resolution firm has filed many Offers In Compromise over the last 16 years, most of our clients who owe large back taxes to the IRS do not qualify. Simply put, they have too much equity in assets (bank accounts, houses, retirement accounts, etc) and/or cash flow (what’s left over after what the IRS allows for basic living expenses) to qualify. So that begs the question, what are my options? While bankruptcy can sometimes be a good option, we will leave that discussion for another article (see archives for February 2011). Short of running out the statute of limitations on collection, which is generally ten years, or hitting the lottery or inheriting a boatload of money and paying off the IRS tax debts in full, the only option left is an installment agreement. However, not all installment agreements are equal. The IRS has two different types of installment agreements to pay off back taxes. The first type is a Full Pay Installment Agreement. In this type of IRS installment agreement, the monthly payments are sufficient to pay off the back taxes (plus any penalties and interest that accrues) until it is paid off in full. With this type of IRS installment agreement, your payments will full pay the back IRS tax debts, as well as all penalties and interest accruing on the debt, within the statute of limitations on collection. The statute of limitations on collection is generally 10 years. However, there are numerous actions that can extend the time the IRS has to pursue collection action (liens, levies, seizures, etc). We will leave that to another article to discuss. The second type of IRS installment agreement is called a Partial Pay Installment Agreement. Under this type of IRS installment agreement, the monthly payment is insufficient to pay off the back taxes plus accruing penalties and interest by the collection statute expiration date. What does this mean in plain English? Well, it means that you make payments until the statute of limitations on collection (in IRS speak the “CSED”) runs out. So if at the collection statute expiration date there is $10,000 of unpaid back tax debt, it expires to zero and you do not owe it anymore. Nice huh? There is one catch however. As part of the terms of the Partial Pay Installment Agreement, the IRS will review your financial condition every two years to see whether or not your financial condition (i.e. your ability to pay more) has improved. If it has, they will require a higher payment if your financial condition shows you can afford to pay more towards the back tax debt. The downside of this type of installment agreement is it is possible that in the future your financial condition improves and the new monthly payment required becomes sufficient to full pay the back taxes, penalties, and interest by the collection statute expiration date. In other words, it’s possible to start out with a Partial Pay Installment Agreement and end up with a Full Pay Installment Agreement. The positive aspect of a Partial Pay Installment Agreement is that if your financial condition does not improve enough or at all, you could still end up paying less than the full amount owed and end up with a large balance of unpaid back taxes expiring to zero at the collection statute expiration date. With all IRS Installment Payment Agreements, your financial condition is reviewed via a Form 433-A and/or 433-B depending on whether your tax issues are personal or business tax debts. Individuals and sole proprietorships use the Form 433-A while corporations, partnerships, and LLCs use a Form 433-B. If you owe personal taxes and have income on your personal tax return from a flow through entity (S corporation, partnership, or LLC treated as an S corporation or partnership), you may have to submit both the Form 433-A and the Form 433-B to get your installment payment agreement approved. There are strategies to minimize your monthly payment amount but that will be discussed in a future article. Also, just because the IRS initially denies your IRS installment payment agreement does not mean you should give up. Many initially rejected IRS installment payment agreements were later accepted upon filing an Appeal to the IRS Appeals Division. Persistence and perseverance are key to obtaining a fair IRS installment agreement that you can live with. Roni Deutch, the tax attorney who heavily advertised her IRS tax resolution services before she was forced out of business, has pleaded not guilty to contempt of court charges. Deutch billed herself as the “Tax Lady” in her infomercials before she closed down her law firm and surrendered her law license last month (see ‘Tax Lady’ Roni Deutch Closes Firm amid Allegations). She was sued for $34 million last August by the California Attorney General’s Office, which accused her of swindling clients who had gone to her firm seeking help resolving their outstanding tax debts with the IRS (see California AG Sues ‘Tax Lady’ Roni Deutch for $34M). In April, a California judge froze her assets after the Attorney General asked the court to hold her in contempt for shredding millions of documents and diverting hundreds of thousands of dollars in funds from her clients (see ‘Tax Lady’ Roni Deutch’s Assets Frozen by Judge). During her arraignment Friday in Sacramento Superior Court, Deutch’s attorney registered a not guilty plea on her behalf to the contempt of court charges, according to The Sacramento Bee. A California judge has frozen the assets of “Tax Lady” Roni Deutch after the state attorney general asked the court to hold her in contempt for shredding millions of documents and wrongfully diverting funds from clients of her tax law firm. Sacramento Superior Court Judge Shellyanne W.L. Chang signed an order Wednesday freezing Deutch’s assets and appointed a receiver who will take over the financial aspects of her business. Deutch heavily advertises her services for helping clients resolve their problems with the Internal Revenue Service, but has been the subject of a $34 million lawsuit by the California Attorney General’s Office accusing her of swindling clients (see California AG Sues ‘Tax Lady’ Roni Deutch for $34M). Attorney General Kamala D. Harris asked the court on Wednesday to hold Deutch in contempt of court, imprison her for five days on each violation, and fine her thousands of dollars for shredding millions of pages of documents and failing to pay refunds to her clients in violation of a court order. In August, the attorney general filed suit against Deutch for swindling thousands of people facing serious and expensive tax collection problems with the IRS. On August 31, the court issued an order that prohibited Deutch from destroying evidence. “Despite this order,” the attorney general said, “Deutch has been routinely shredding documents on an almost a weekly basis.” The Attorney General estimates that to date Deutch has shredded some 1,643,000 to 2,708,600 pages of documents. Deutch’s shredding campaign has permanently deprived the attorney general of evidence needed to fully prosecute the action against her. Deutch’s law firm, based in Sacramento County, had revenues of at least $25 million a year. She spent $3 million a year on advertising, much of it on late-night cable TV, and frequently offered tax advice on popular TV shows. In her pitches, she promised to significantly reduce the IRS tax debts of people who signed up with her firm. Instead, she took thousands of dollars in up-front fees from clients but offered little or no help in lowering their tax bills. Hundreds of clients complained to the Attorney General and other government agencies. For instance, Deutch opted to transfer hundreds of thousands of dollars in equity from the sale of her home to a media firm. She also personally withdrew $241,000 from the law firm’s accounts and her personal accounts at just one bank. In addition, since the preliminary injunction order was issued, Deutch made more than $21,000 in unnecessary expenditures, including gifts to family and friends, and a payment to a NASCAR racing team. The attorney general asked the court to fine Deutch $1,000 and imprison her for five days for each count of contempt, to immediately freeze Deutch’s personal assets, and to appoint a receiver to manage her law firm’s business operations. A spokesperson for Deutch’s firm did not respond to a request for comment. A Santa Monica man was arrested Friday morning on charges that he committed tax fraud and attempted to interfere with the administration of the Internal Revenue laws. 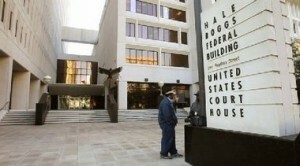 Howard Hal Berger, 51, appeared Monday morning before U.S. District Court Judge John F. Walter. Berger previously pleaded not guilty to the charges specified in an indictment returned by a federal grand jury late last week. According to the indictment, Berger filed a partnership income tax return for Lab Holdings LLC for the 2006 tax year which falsely reported a contribution of $1 million, substantially reducing his income tax liability. In addition, Berger filed an individual income tax return for the 2006 tax year which falsely reported gifts to charity of $991,700 on the attached schedule of itemized deductions. While under audit by the Internal Revenue Service, Berger submitted a false charitable donation letter in an attempt to substantiate the deduction for gifts to charity taken on the 2006 individual income tax return. If convicted of all charges specified in the indictment, Berger faces up to nine years in prison and fines totaling $750,000. Berger is currently free on bond pending trial. A trial is scheduled for Aug. 9, 2011, before Judge Walter. The investigation of Berger was conducted by IRS-Criminal Investigation in conjunction with the U.S. Attorney’s Office in Los Angeles. A former St. Charles Parish Sheriff’s lieutenant and his wife, who owned an accounting service company, pleaded guilty to fraud in federal court on Monday for filing false federal tax returns and collecting more than $800,000 using the names of inmates held in the parish jail, according to U.S. Attorney Jim Letten’s office. The couple is said to have filed false tax returns over a 10-month period from about April 8, 2005 to about Feb. 20, 2006. Lt. Warren LeBeauf Jr., 42, and his wife, Tamara Scott-Landry, 37, entered the guilty plea the morning of their trial before U. S. District Judge Carl Barbier, authorities said. The two were charged May 6, 2010 in an 88-count indictment and are set for sentencing on the charges on Sept. 22 before Barbier. They face a maximum of 10 years on the conspiracy to commit fraud charge, a fine of $250,000 and up to three years of probation. Scott-Landry, who also pleaded guilty to wire fraud and aggravated identity theft, faces a maximum 20 years on the wire fraud charge and a mandatory two years added to any sentence she receives for the aggravated identity theft charge. LeBeauf, who had been employed by the Sheriff’s Office since 1989 and worked as a resource officer at Destrehan High School, was terminated July 30, 2010 for violating department policies, said St. Charles Sheriff’s Office spokesman Capt. Pat Yoes. According to federal authorities, LeBeauf used a law enforcement data base to obtain personal information on inmates such as Social Security number and birth date and passed it along to Scott-Landry to make fraudulent income tax refund claims. Authorities say that LeBeauf met a St. Charles Sheriff’s Office 911 call center operator at a park and paid $100 for more than 4,000 pages of print outs from that law enforcement database which was used to fraudulently collect approximately $810,183 in income tax refunds. Yoes said the operator, who had worked for the department for nearly 30 years, resigned July 2, 2010 before disciplinary action could be taken against her. The tax forms filed electronically with the IRS made the returns payable to cashiers checks and stored valued cards. The money was then deposited into bank accounts controlled by LeBeauf and Scott-Landry, authorities said. According to the indictment, the individual tax return amounts ranged from $1,577 to $3,525. At one point authorities say Scott-Landry withdrew $26,000 in cash over a three-day period from an ATM and the couple went to a Chevrolet dealership and bought a 2004 Chevrolet Suburban “with a paper bag full” of cash. It was in that SUV, parked in the drive way of Scott-Landry’s house, that authorities say they found inmate names and other items used in the scam. During the execution of a search warrant, and “in the presence of almost a dozen armed IRS agents,” authorities say LeBeauf arrived at the house with an unknown person and attempted to leave with the SUV. The case was investigated by the Internal Revenue Service, Criminal Investigation Division which has made investigatin refund fraud and identity theft a top priority said James C. Lee, special agent in charge, IRS criminal investigation. Last September, Laguna Beach resident Stephen McDow found $110,000 deposited in his bank account, courtesy of the IRS. That same deposit has now landed him in hot water, according to CBS Los Angeles. The IRS mistakenly sent the tax refund money, meant for a 67-year-old woman, to McDow, instead, reports local news station KCAL. The Los Angeles woman reportedly failed to inform the IRS that she had closed the bank account she had filed with them, and the account number was subsequently assigned to McDow. When the woman discovered that McDow had been the recipient of her refund, she called him and demanded her money back. McDow, in turn, offered to pay back the balance in monthly payments, as he had already spent $60,000 paying off student loans and his home mortgage. Unsatisfied with the suggested size of the monthly payment, the woman declined the offer, according to KCAL. McDow was subsequently arrested and charged with one felony of grand theft by misappropriation of lost property. He reportedly faces four years imprisonment and is currently being held on bail for the exact amount he first received: $110,000. SAN FRANCISCO (MarketWatch) — The IRS catches almost 3,000 tax scofflaws in its own ranks each year, but some employees still dodge the system, according to a new Treasury Department report. The Internal Revenue Service’s internal program caught on average about 3,000 incidents of noncompliance on employee tax returns each year from 2004 through 2008 — that’s about 3% of its workforce — but 133 employees who may have violated tax law avoided that program’s net in 2006 and 2007, according to the report from the Treasury Inspector General for Tax Administration, or TIGTA, which monitors the IRS. The potential violations include failure to file a tax return, filing late, failure to report income and failure to pay taxes due. While the report found that only a tiny portion of the IRS’s some 107,000 employees (in 2007) slipped through the cracks, TIGTA called on the tax agency to root out any and all workers who may be trying to game the system. “In the inspector-general community, we have a zero-tolerance policy for any incidence of fraud, waste or abuse,” a TIGTA spokeswoman said. Also, the IRS said that it investigated the 133 problem cases and most did not constitute fraud. “In 44% of the cases, employees filed a tax return late but were due a refund. And over half the cases have already been reviewed and closed because the facts did not merit further review. We are analyzing the rest of the cases, and if there are problems they will be addressed,” the IRS said. While the scope of the problem appears to be small, examples of IRS workers committing fraud are not hard to find. An IRS agent in Santa Clarita, Calif., in May was sentenced to three years in prison for filing fraudulent returns “for himself and innocent relatives that claimed, among other things, bogus deductions for alimony and mortgage payments,” according to a U.S. Justice Department release. In April, a part-time data-entry clerk at an IRS office in Fresno, Calif., was charged with filing false tax returns and committing wire fraud and identity theft after allegedly stealing 68 tax returns from an IRS office, filing fraudulent returns using taxpayers’ personal information and claiming excessive federal tax withholding, presumably to generate tax refunds. Separately, another IRS employee in Fresno in April pleaded guilty to filing false income-tax returns in the names of her husband, who was in state prison at the time, and other prisoners. The tax returns claimed federal tax withholding on wages the prisoners had never earned, to generate tax refunds. The IRS issued tax refunds totaling more than $13,000 based on the false returns, according to Justice Department statement. And a separate TIGTA report in 2009 found that 128 IRS employees claimed the first-time home-buyer tax credit, even though they might not have been eligible. TIGTA simply identifies potential problems that require further investigation by the IRS. Andrea Coombes is MarketWatch’s personal finance editor, based in San Francisco. A seized Medford Square restaurant charged patrons a meals tax but didn’t pay what they collected to the state, a Department of Revenue Spokesman said Thursday. Il Faro, an Italian eatery located at 21 Main St., was seized by the Department of Revenue last week because it owes the state a total of $142,784.20 in taxes and penalty fees, department spokesman Bob Bliss said. Nearly all of the back taxes, which date back to 2006, stemmed from the meals tax, he said. “Patrons paid the meals tax, but the restaurant didn’t forward that to DOR,” Bliss said. Seizing a business is the last thing the Department of Revenue will do in their efforts to collect unpaid taxes, Bliss said. The restaurant had an orange sign on its door Tuesday, reading “SEIZED.” Several florescent signs remained lit inside the windows of the Italian eatery Tuesday afternoon. If Giuseppe Longo, the owner of the restaurant, can come up with a reasonable down payment and payment plan going forward, the business could be reopened, Bliss said. The business, not the building, was seized. If a payment plan isn’t agreed upon, the property of the restaurant will go to auction in about 4 to 6 weeks, Bliss said. A call to the restaurant Tuesday was unanswered. A restaurant in Medford Square has been seized by the Massachusetts Department of Revenue for nonpayment of taxes, according to a sign on its door. 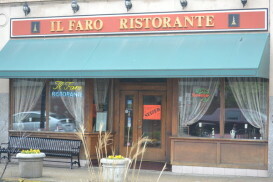 Il Faro, an Italian restaurant located at 21 Main St. in Medford, had an orange sign on its door Tuesday, reading “SEIZED.” The sign was dated May 11, 2011. Several florescent signs remained lit inside the windows of the Italian eatery Tuesday afternoon. According to filings with the Massachusetts Secretary of State, the owner of the business is Giuseppe Longo. Il Faro first filed as a business with the Secretary of State in 1996, according to state records. The business was seized but not the building.